Are you looking for some last minute gifts this year? Have no fear! We have scoured the web for some of the best Mason Jar DIY and Crafts that will make your monthly or last minute gifting a breeze. Check out our 31 Days of Christmas Giving with Mason Jars for trendy ideas that are easy to haul to your next party and ultra fun! Anyone you give to will love the time you spent creating these Mason Jar ideas but you will also have fun making them. Lets get started! 1) This Salsa mason jar gift from Meaningful Mama is delicious and adorable. This would be an excellent gift idea for teachers, neighbors, and friends who you know love a spicy kick in their lives. 2) This Bubble Gum Mason Jar gift idea + matching printable is absolutely adorable. If you have a babysitter that you have worked with for quite some time this would be an awesome gift to give them. And to put it frankly, who doesn’t love bubble gum…even just a little bit. 3) The Teacher Survival Kit Mason Jar is one of the most clever things I have seen. Ever. Pack it with things every teacher needs, like tic-tacs, notepads, lint rollers, and pens. Your teacher will love that you chose to give a gift that is filled with things that they will actually use. 4) Fun-A-Day blog posted a wonderful grandparents gift idea: the painted hand print mason jar. Letting kids be a part of the DIY/Crafting fun is so worth the extra time. Kids get to have a productive, messy, experience while making a gift for people they love. 5) This DIY Apple Mason Jar is another perfect teacher gift. It also can be spruced up to look very similar to Santa if you catch my drift. This would look absolutely adorable on a teacher’s desk year around. 6) Make a Modge Podge Mason Jar Candle, and tie a small bubble bath to the lid for a nice relaxing present. This would be a great gift for the person you know that works hard every single day, and needs a break badly. So this means you can send this one over to me. I’d love to read a book while taking a bubble bath. 7) Make a tinted mason jar for storing anything from pens, pencils, rulers, to makeup brushes. These come out beautifully, and you can make them in a variety of color combinations. Bonus points if you know someone’s favorite color(s) before giving this to them. 8) Make a Mason Jar Lantern with Beaded Handle from Buggy and Buddy for your kids this year. Create them together then take them out for a stroll to see all the Christmas lights hung throughout the neighborhood. 9) Make beautifully festive frosted mason jars for storing anything you’d like. Personally I have always adored the frosted look. It doesn’t look homemade at all, and has a very professional and expensive look and feel. Whoever you choose to give this to will absolutely adore it. 10) Here’s a mason jar idea for Santa from DIY Inspired! This is especially useful if you have pets who love to eat the cookies you have left out on Christmas Eve. Put Santa’s treats in a mason jar and add your very own personalized tag. This is originally made for teachers, so you can also gift to them as well….or why not both? 11) Gift your kids an afternoon of activity time with mom (or dad) with this Fireworks in a jar activity from I Can Teach My Child. One of the best gifts you can give is educational time with your kids. 12) Give a Mason Jar Snow Globe filled with memories of a white Christmas to someone you spent quality time in the snow with. It could be your husband, or one of your children. Snow globes always have a special meaning behind them. 13) Fabric Jar Lanterns are an extremely fashionable way to give a gift. Get lost in the beautiful fabrics available at your local shop and make the most beautiful lanterns you have ever seen. 14) Decorate a mason jar with pressed flowers and leaves for a very unique kitchen decor gift. Imagine how wonderful it would look on the window sill of a kitchen, catching the light from the gorgeous winter days. 15) Mason Jar Hot Chocolate…with Chocolate Dipping Spoons. Excuse me while I drool all over my keyboard. This time of year is everyone’s favorite for hot chocolate. Make a few of these and give them to those you know love to snuggle up with a warm cup of cocoa. 16) Do you know how nice it is to receive cookie mix in a jar? Give the gift of homemade cookie mix this year, and make someone’s Christmas baking a little bit easier. It just so happens mason jars are the best type of jar for this kind of gift. 17) Let your kids make some lavender sugar scrubs to gift in a mason jar. Sugar scrubs are my favorite, you might end up wanting to keep this one for yourself. Especially with the calming and soothing scent of lavender. 18) If falling asleep isn’t your thing, you can also make spectacularly spicy cinnamon body scrub. As with the lavender sugar scrub, the presentation is perfect in a mason jar. 19) Turn your kid’s artwork into a keepsake with this kids art jar tutorial from ZingZingTree. Using a mason jar is just one of the ways you can make this craft unique to you. This is a perfect grandparent or teacher gift. 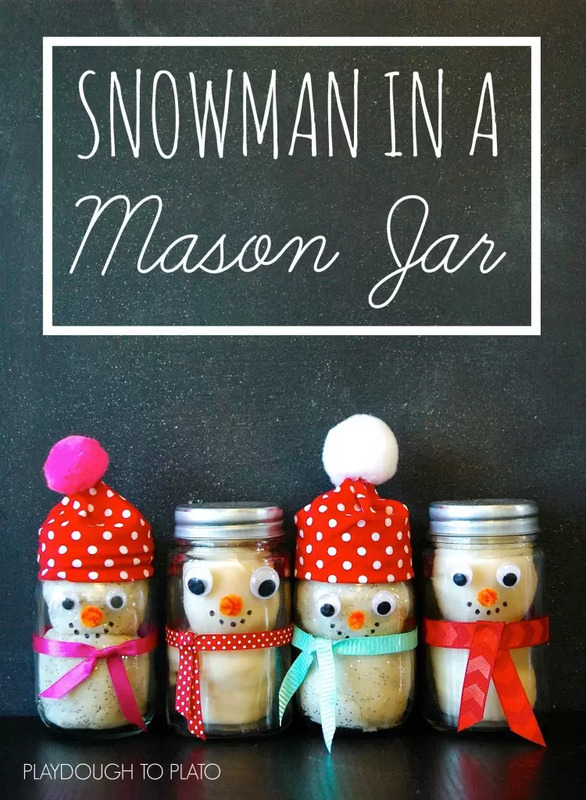 20) Make some adorable Snowman in a Mason Jar gifts like Playdough to Plato did. If you have any children you spend a lot of time with (nieces, nephews, grand kids, or students) this would be a wonderful idea. An adorable gift that leads to hours of play! 21) Give your friends who miss summer a beach in a jar. You know I might make this one for myself, because I love the beach, and can’t wait for the weather to be warm enough to go again! 22) Make awesome antique toy storage jars for your kids. This is the perfect gift for your child if they love to collect things, especially small things. 23) Do you know someone with a green thumb? Or have a favorite clerk at your local garden shop? Make them a garden in a jar, they will definitely love it. 24) Mason Jar Soap Dispensers are so crafty, I just love them with everything I’ve got. This is a great gift idea for someone who is a new homeowner, or has moved recently. These little things are often on the back burner when furnishing new homes. 25) Make a Mason Jar Advent Calendar Wreath to raise excitement about Christmas. Advent calendars are so exciting for kids, they are sure to love this one. 26) Teach some money literacy with a super cool custom super hero piggy bank…made from a Mason Jar. The wonderful thing about this DIY project is you can make sure you create the absolute favorite theme. It also fits nicely in a stocking, possibly with a few coins already inside? 27) This craft activity doesn’t use the entire mason jar, and is perfect if you have mason jar lids laying around unused. Make an ornament out of a mason jar lid, the creative options are limitless. 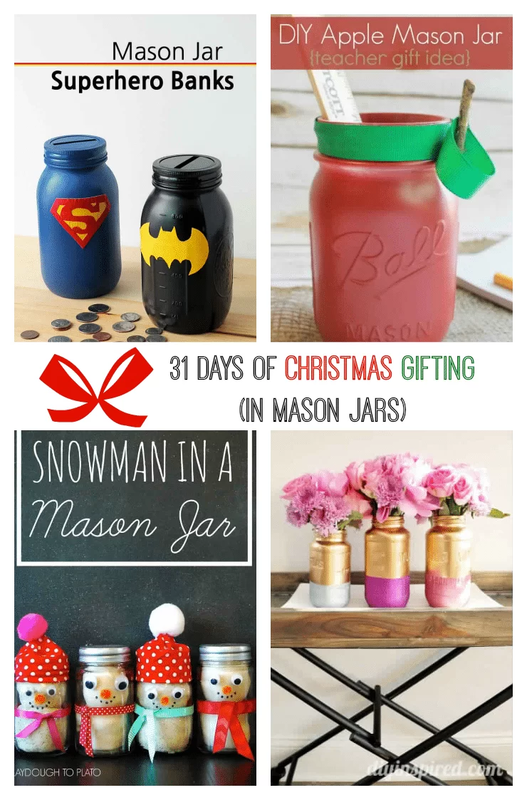 28) Your kids will love making this DIY Mason Jar Snowman for their teachers or principal. There is so much room to make personalized touches with this activity as well. 29) These Winter Mason Jar Lanterns from Mama Papa Bubba are absolutely gorgeous, and would be a lovely addition to any mantle this season. 30) A Mason Jar toothbrush holder is another wonderful gift for new home owners, or for new college students that recently moved away from home. Dorm life is hard, and they will appreciate a place to store their toothbrush safely. 31) DIY Inspired has done it again with these gorgeous centerpieces. Gold and glitter, I doubt there is anything better than that combination. Glitterfy your mason jar centerpiece with a holiday color and you have a perfect Mother in Law/Best Friend/Aunt present on your hands. It has been one of my favorite things to do: watching all the mason jar ideas floating around the web. I love every single one of these, and I cannot wait to see what comes up next. When it comes down to it, Mason jars are wonderful gift giving tools. Follow more fantastic craft ideas on our pinterest board here! « Permanent Marker Craft Projects Download: FREE!